December 2018: The ultra-luxury fashion brand hotel has partnered with the award-winning Dubai Creek Golf and Yacht Club to launch the first-of-its-kind promotion for the United Arab Emirates, offering complimentary boat transfers on the Creek’s charter boat ‘Creek Breeze’, from Jaddaf Waterfront Marina to the golf club. Combining grandeur and opulence with true craftsmanship and exquisite taste, the extraordinary Palazzo Versace, surrounded by landscaped gardens and its own private marina, is one of Dubai’s most prestigious waterside addresses, occupying a historical spot on the banks of Dubai Creek in the heart of the burgeoning Jaddaf Waterfront, offering unobstructed views over Dubai Creek and beyond. Eight contrasting dining venues feature menus from Michelin-starred chef Mansour Memarian, Director of Culinary and F&B of the property, whilst 1000sqm of wellness typifies the stunning boutique SPA, offering the perfect complement to a golfing break. The world acclaimed course at Dubai Creek Golf and Yacht Club is a short ten minute boat ride across the water from the resort’s own berths, and has been voted one of the world’s ‘Top 100 Must-Play Golf Courses’ making it one of the most recognised golf courses in the world. Set in indulgent, lush surroundings, against the beautiful backdrop of the city skyline, the course which was designed in association with 2018 Ryder Cup Captain Thomas Bjorn, integrates into the natural surrounds whilst embracing the culture and heritage of Dubai. Well-groomed fairways lined with date palms and coconut trees, attractive water hazards and shrubbery lends a tropical air to the Club’s 18-hole, par-71 championship course that rolls into thousands of undulating yards. The majestic Clubhouse – its design mirroring the sails of the traditional Arab dhow – has been one of the most photographed landmarks since it opened in 1993, capturing the essence of Dubai’s seafaring traditions and presenting the perfect fusion of heritage with modernity and style. 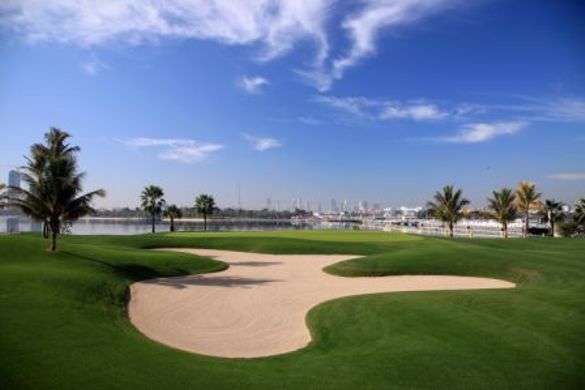 “We are delighted to be partnering with Dubai Creek Golf Club. Having a stunning golf course facility added to one of our leisure activity options will strengthen our positioning as a luxury urban resort.” said Sandra Tikal, General Manager of Palazzo Versace Dubai. Destinology, the travel experts, offers a three-night stay at Palazzo Versace Dubai from £999 per person, based on two people sharing a Deluxe Versace Room – Culture Village View on a b&b basis and including return Emirates flights from either London Heathrow or London Gatwick, transfers and a free Dubai city tour and Nikki Beach access. Based on travel from 15 Jan 2019. For further information or to book visit Destinology.co.uk or call 01204 474801. Palazzo Versace Dubai’s Stay, Cruise and Golf package is available for a supplement, from AED 1,820 per room, per night when booking a three-night stay, booked before 30 April 2019. Ts and Cs apply. Reminiscent of a 16th century Italian Palace, Palazzo Versace Dubai is a Neoclassical masterpiece with subtle traces of Arabian architecture. Featuring a striking entrance, high ceilings, landscaped gardens, and a range of well-crafted Italian furnishings, the hotel is truly symbolic of the Versace lifestyle. Set in the heart of the Jaddaf Waterfront, less than 15 minutes away from Dubai International Airport and eight minutes away from Burj Khalifa and Downtown Dubai, Palazzo Versace Dubai is conveniently located along the shores of the historic Dubai Creek.